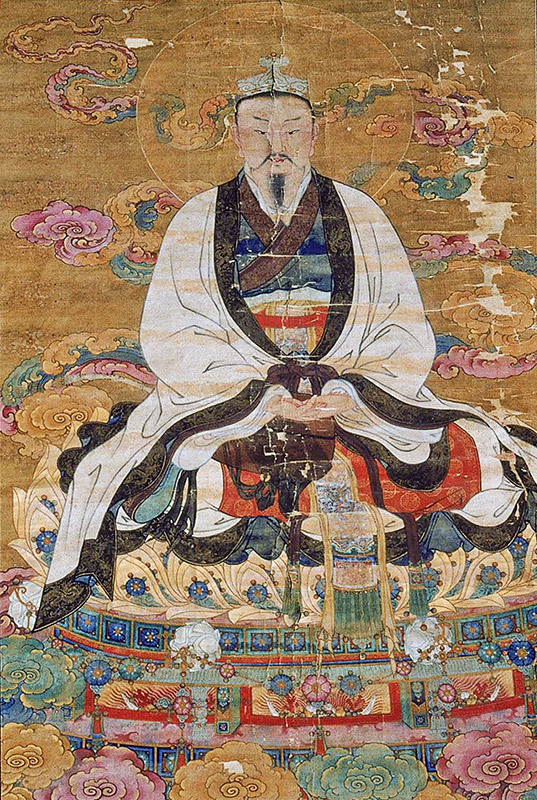 The Jade Emperor (玉皇大帝 yù huáng dà dì) is famously known as the leader of the Heavens in traditional Chinese folklore, especially in Taoism, and also in Journey to the West, the classic novel about Monkey King and Tang Monk on a dangerous quest for Buddhist scriptures. According to the Records of the Virtuous Jade Emperor, he was once the prince of the Shining Wondrous Kingdom (it sounds much more elegant in Chinese). This is a kingdom that existed a long, long time ago. Under the rule of the King of Pure Virtue and the Queen of Gilt Moonlight, the kingdom was peaceful and happy. But the king and queen were growing old and still heirless. “When I am gone, who will take care of the kingdom?” worried the elderly king. So he ordered the kingdom’s Taoist priests to pray to the deities for a son. For over half a year, the king and queen also prayed twice a day without fail and without results. Finally, their heartfelt appeal moved the Primeval Lord of Heaven. 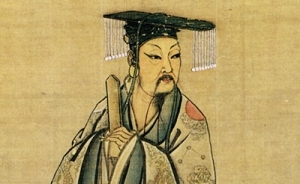 He created a child for the king and queen and then sent a Taoist deity to bring him to the couple. That night, fast asleep, the queen dreamed of a saintly glow enveloping the palace. The Taoist descended from the sky, holding a beautiful, radiant infant. Kneeling in front of the saint, the queen begged, “My king has no heir. I plead for your compassion that you may grant us this child.” The Taoist replied, “This is no ordinary child. One day he will attain the highest level of Tao. You must take good care of him.” The queen thanked the deity and held out her arms to receive the boy. The deity passed the child over, but he weighed as much as a mountain and the queen awoke in shock. She hurriedly went to inform the king who, wondrously, had the exact same dream. The next day, the queen discovered she was pregnant, and a year later, a beautiful prince was born. His body shone with golden radiance, lighting up the entire kingdom. When he came of age, he gifted the kingdom stores of food and gave treasures to the poor and the orphaned. Some time later, the old king passed away. After the prince ascended the throne, he ruled with wisdom and benevolence. But he soon realized that all beings in his kingdom were suffering and had no way of breaking the cycle of death and reincarnation. He thus abdicated the throne and, leaving the kingdom to a virtuous minister, entered the mountains. There, he sought the Way, or the Tao, hoping to unravel the mysteries of the universe and break through the limitations of mortality and suffering. He cultivated his spirit arduously for 3,200 kalpas to finally attain enlightenment and become a Taoist saint, and spent another 100,000,000 kalpas gaining enough virtue to become the ruler of Heaven. How long is one kalpa? About the time between a universe’s creation and subsequent recreation. In the 16th century Journey to the West, the Jade Emperor is depicted as grand and austere, but also easily frightened and rather incompetent. 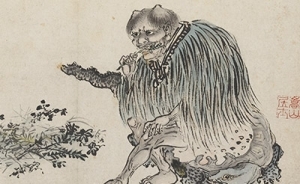 He frets constantly, defers to his advisors on important decisions, assigns a monkey to “guard” a garden of magical peaches (in Chinese culture, monkeys are commonly associated with eating peaches instead of bananas), and generally seems capable of doing nothing besides issuing orders atop his throne. In many ways, he seems more like a human ruler than a divine one. But all stories need colorful supporting characters. And all stories need, first and foremost, to entertain. And in a story that spans almost the entire Buddhist and Taoist pantheon—from Bodhisattva Samantabhadra to the Three Pure Ones—not every deity can be perfect. Evidently, being the Emperor of Heaven is no easy task. 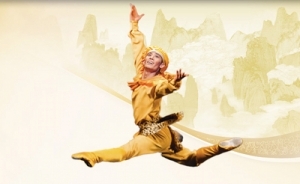 Little wonder that, in Journey to the West, when Monkey King tries to argue that the Great Jade Emperor should abdicate his heavenly throne and hand the seat over to himself, a monkey who at this point is not even 400 years old yet, he gets crushed under a mountain for half a millennium.